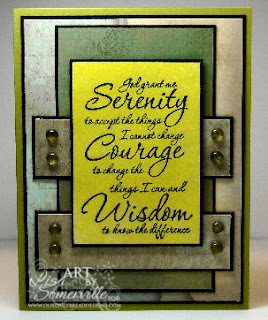 Just a quick card using SCS Sketch 218, a sketch I can see using with many images. It's also a great sketch to use up some of the DSP I've been hoarding! My focal image started out as Opalite Infusion, but the colors just weren't very vibrant, so I morphed that tech with some homemade Shimmer Spray, spraying directly over my Opalites, kinda adds more shimmer by mixing the two techniques. Very nice card, Lisa. I am sure the added homemade shimmer spray gives it an added sparkle - I find I use my homemade shimmer sprays a lot!